For the ephemera of Kuntz’s Pond, the excitement of a sunrise can be the highlight of a life. But a tragic encounter in a mysterious cave teaches them lessons about the uncertainties and brevity of life. 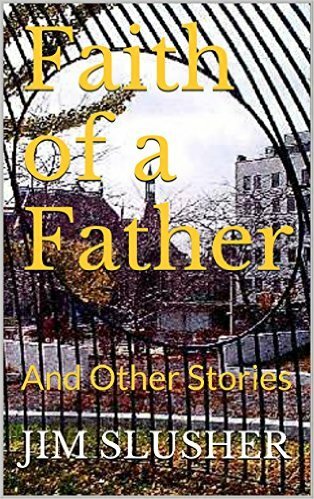 Their story, excerpted here, is one of a diverse collection of tales in Faith of a Father and Other Stories, available in e-book on amazon.com, including a father’s life-changing confrontation with the meaning of religious faith, a gunfighter’s lonely quest for peace on a hot Kansas afternoon, an orphaned teenager’s encounter with justice and more. It was during this frivolity that Minnion saw the most stunning sight he had ever witnessed. A yellow light beamed alone out of the darkness. It ignited his imagination, and his full attention became its captive. The light flowed toward him in pale streams through several huge holes that ringed the top of an isolated, oddly shaped cavern sitting alone in a clearing of trees. The mysterious enclosure looked to him something like a giant stone bubble, and it rose from an infinitely long stream of rock winding through the forest. The somber yellow light did not stretch itself very far. Still, it cast eerie and varied shadows against the nearby trees and bushes as it poured out of the cavern’s various holes. Afire with excitement, Magellan sped toward the vision with Minnion and Demian in close pursuit. The thought suddenly had struck him that he may have happened on the very source of the sun, and he grew determined to get as close a look as possible. So engrossed was he that he completely ignored two furbearers who would normally have stopped him in mid-flight, for they walked strangely on only their hind legs, unlike any furbearer known to have visited the pond. He sped past them and steered himself toward one of the portals through which the light streamed, expecting to slip easily inside the cavern. But the hole would not let him pass. The effect was quite consternating. He could see the source of the light — a small, bright fire hanging from the ceiling of the cavern. But some invisible force held him back. Minnion and Demian had tried separate holes. Like Magellan, Demian had found an impenetrable portal. Minnion, however, had not met the least resistance — and his friends watched helplessly as he fluttered easily into the enclosure and raced toward what Magellan had now decided could only be the waking sun. Magellan had to try several other holes before he, too, could lip inside the cocoon, but slip inside he did — his heart pounding furiously, his imagination racing. Demian was not long in joining them at the birth of the daylight. Magellan marveled that the three pioneers had barely embarked on their trip before they had discovered the very place where the sun begins. He imagined that they would follow the beams back to the pond. He thought how all of the Watchers back home would be dancing there on the morning water, waiting. Then they would see him with the sun’s rays just behind. It would seem as though he were carrying the light to them in his jaws. And when he told them where he had found it, his place next to Demian’s in the History would be assured. He attempted to wrap his body around the sun just as his soul already embraced its beauty. He immersed his imagination in its splendor and let the warmth emanating from it washing over every point on his body. He dipped his wings toward the heat as eagerly as he would have touched them to the surface of the pond. He crawled across it, back and forth, back and forth, trying to burn that ecstasy into his memory. Minnion was not certain. He had not thought to realize that this was just the beginning of the sunrise. He thought this was all there was to it. Magellan looked to Demian for support. He did not find it. The elder just kept crawling back and forth across the surface of the supposed sun, touching it with his wings and poking at it with his legs. Demian did not get to finish his sentence. He was cut off as abruptly as if he had been gobbled by a trout. Two loud thuds, like trees slamming to the forest floor in quick succession, shook the universe. The noise extinguished the sun. It was impossible, Magellan thought. One wingbeat, the three of them were clinging to the very sun itself. The next, they were hanging from a cold piece of stone, as smooth as the surface of the pond, as lifeless as the dust on the ground. His heart stopped. His head struggled to understand. Had the sun gone out? Or was this not really the sun? The three mayflies chattered about the possibilities, but their excitement quickly crumbled beneath the crush of new noises echoing around them. The sounds were clearly the conversation of furbearers, but they were very close. Very close. Judging by the volume and the smell, the furbeareres were within a few hundred wingbeats of the insects’ perch on the burned-out sun. Worse yet, the sounds and smells did not waft off into the distance the way they do on the pond. Instead, they seemed to wad up all together, packing themselves against the three wanderers like too many nymphs in a single cocoon.